With multiple profiles and the optionally enclosed macros you can manage several device/product variant configurations within one and the same project. You can simply switch between profiles and then use the active profile for code generation or prototyping. ★First switch to the Composer containing the project main page. ★Then, in the Gallery window, ensure that the folder Chora is opened. ★Look in the folder for the template named Profile. ★With the mouse, select the template and drag it into the Composer. ★Drop the template within the Composer. Adding a new profile member. ★First ensure, that the profile member is selected. ★Enter the new profile name in the Inspector window. The assigned name identifies globally the profile within your project. The name appears in the profiles selection list and determines implicitly the sub-directory where generated files are stored. Moreover, you can involve the profile name in expressions to conditionally build your application or manage project variants. Through the choice of the Platform Packages you determine the target system to generate the code for. It also affects the conversion of colors, bitmap and font resources. As such, the right choice is obligatory for generating the correct code for your particular target device. ★In the middle area of the Inspector window locate and adapt the attribute PlatformPackage. ★In the middle area of the Inspector window locate and adapt the attribute ScreenSize. ★Accordingly locate and adapt the attribute ScreenOrientation. The choice of the application class determines the root component, the code generation should start with. Accordingly, all other project members referenced (directly or indirectly) from the application class are involved in the build process. Not referenced members, in turn, are excluded from the code generation. ★In the middle area of the Inspector window locate and adapt the attribute ApplicationClass. Per default, Embedded Wizard stores generated files within a folder named after the profile name and located directly below the folder of your project. With the attribute OutputDirectory you can determine another location where to store the files. ★In the middle area of the Inspector window locate and adapt the attribute OutputDirectory. If the selected Platform Package it supports, you can specify individual directories for the include (e.g. *.h), source (e.g. *.c) and resource (e.g. *.png) files. See the attributes OutputIncDirectory, OutputSrcDirectory and OutputResDirectory. With the further attribute CleanOutputDirectories you can control how Embedded Wizard should treat outdated, superfluous files existing in the specified output directories. Per default, Embedded Wizard generates all bitmap resources in compressed format requiring the bitmaps being decompressed when used at the runtime. You can override this behavior and generate bitmap resources directly in the native color format of the target system allowing the pixel information being accessed directly from the ROM code (e.g. flash memory). ★In the middle area of the Inspector window locate and adapt the attribute FormatOfBitmapResources. ★Again in Inspector window locate and adapt the attribute ColorChannelsOrder. ★Similarly locate and adapt the attribute ColorPremultipliedAlpha. Per default, Embedded Wizard generates all string literals in compressed format requiring the strings being decompressed when used at the runtime. You can override this behavior and generate strings uncompressed allowing the information being accessed directly from the ROM code (e.g. flash memory). ★In the middle area of the Inspector window locate and adapt the attribute FormatOfStringConstants. ★... or double click on the profile member with the mouse. You can create any number of copies of an already existing profile member. ★... or hold the key Ctrl pressed while you drag and drop the selected profile member. ★Finally rename the just duplicated profile member. The selection of the current profile affects directly the build process and the prototyping. In particular, the colors you see in the Composer or Prototyper window result from the Platform Package specified in the currently selected profile. You can easily switch between several profiles by using the profile selection combobox. Additionally when generating code in batch mode, you can select any arbitrary combination of profiles to generate the code for. 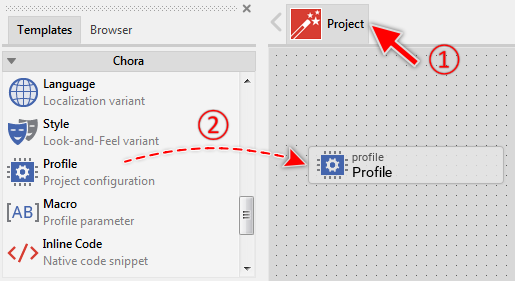 Profiles and the enclosed macro members can be evaluated in expressions and conditions allowing particular components or code fragments being compiled conditionally depending on the selected profile. Moreover, you can use the name of a profile in the Generator and VariantCond attribute of any other member in your project to control its code generation. ★Press the key DEL or select the menu item EDIT➤Delete. Determines the name of the application class to use when generating code for a particular profile member. Determines an optional name of the application when generating code for a particular profile member. Determines an optional title of the application when generating code for a particular profile member. Determines the position and the size of a profile member brick within the Composer window. Controls how superfluous, outdated files found in output directories should be treated. Determines a CLUT (color lookup table) file to use when generating code for a particular profile member. Controls the color conversion of bitmap resources when generating code for a particular profile member. Controls the color conversion of bitmap resources when generating code for a particular profile member. Affects the RGB565 bitmaps only. Contains the description for the profile member. Controls the conversion of bitmap resources when generating code for a particular profile member. Controls the conversion of strings when generating code for a particular profile member. Controls the format of the generated code. Controls the optimization level when generating code for a particular profile member. Determines the destination directory default for all generated files. Determines the destination directory particular for generated include files (e.g. *.h). Determines the destination directory particular for generated source files (e.g. *.c). Determines the destination directory particular for generated resource files (e.g. *.png). Specifies a name prefix for the generated code files. Determines the Platform Package to use when generating code for a particular profile member. Determines a command to execute at the end of the build process. Determines the actual installation orientation of the display in your target device. Determines the actual resolution of the display in your target device. Controls the amount of inline comments included into the generated code.